Off plan luxury villas with option to personalise interior, in La Reserva de Sotogrande. 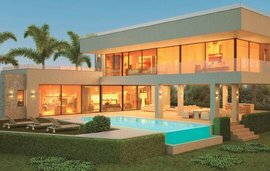 These stunning off plan villas are located in the sought after address of La Reserva de Sotogrande. Situated on the Mediterranean coast in the municipality of San Roque, Cadiz. This high-end residential complex is bordered by Los Los Alcornocales Natural Park. They overlook the golf course and the Mediterranean sea. 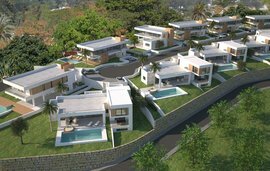 With communal facilities including swimming pools, gym and padel court this really is an amazing opportunity to purchase a fabulous off plan modern villa in a superb setting. With a detached villa for Phase III starting at 604,000 euros and the possibility of personalising the interior, this really is a fabulous opportunity to purchase a modern property in an ideal location. This property has the accommodation spread over three floors with a large open plan living /dining room on the ground floor and a good sized kitchen as well as a downstairs guest toilet, the first floor has 3 bedrooms and 2 bathrooms, with two of the bedrooms having access to the upstairs terrace. On the top floor you have a fabulous solarium where you will be able to enjoy the views and sunbathe. Other features besides the fabulous communal facilities, include floor to ceiling windows, large terraces, underfloor heating, automatic irrigation system, solarium with pre-installed Jacuzzi, a garage and private garden as well as a fully fitted kitchen. Building work has already started and they are expected to be completed by middle of 2019.